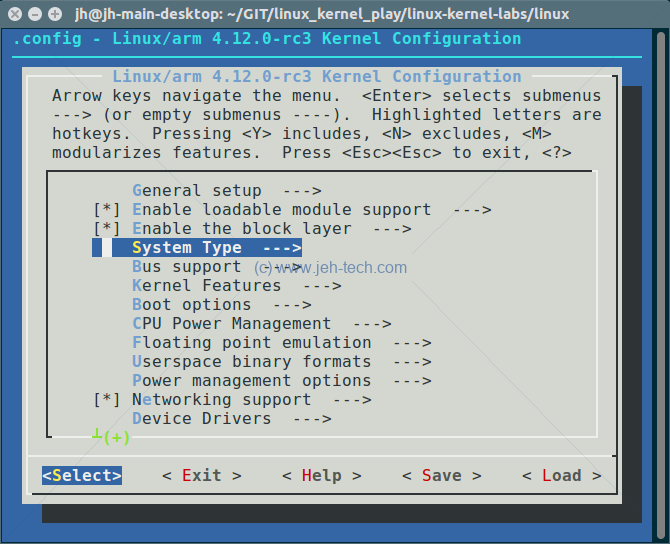 How to configure and build the Linux kernel and write device drivers for it (e.g. adding device driver for Wii Nunchuck by going through the FreeElectons tutorials). Linux Kernel In A Nutshell, Greg Kroah-Hartman, O'Reilly Media (PDF of entire book release by free electrons!). Linux Kernel and Driver Development Training Lab Book, FreeElectrons.com. Linux Kernel and Driver Development Training Slides, FreeElectrons.com. Linux Device Tree For Dummies Thomas Petazzoni. Device Tree presentations papers articles. 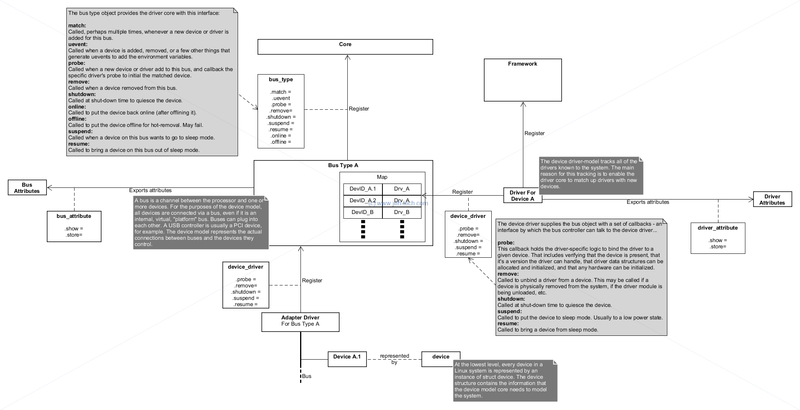 The arch directory contains all of the architecture dependent code. This code is specific to each platform that the kernel will run on. The kernel itself is as generic as possible, but because at this low level it does have to be concerned with architecture specifics this is where you'll find the implementations. The block directory contains the Linux block I/O layer files which are used to help manage block devices, like your hard disk, for example. The Documentation directory is very useful! Here you can find many bits of documentation on the Linux kernel. The files are mostly text files, but under Documentation/DocBook you will find a set of files that can be built using make to produce PDF or HTML documentation. If, for example you are interested in learning about the kernel debugger, there is a book on that in kgdb.xml. If you want to compile the documentation for just this, for example, edit the Makefile under Documentation/DocBook/Makefile and change the variable DOCBOOKS. You can do this by renaming or commenting out the existing variable and re-defining it with just the resource you want (you might want to do this as the build of the complete set of books fails sometimes - or at least did for me). To compile your DocBook, return to the root directory of the Linux source and run make pdfdocs. The PDF will be build and stored in the DocBooks directory. The drivers directory contains a slew of device drivers organised under their type. So, for example, input device drivers (think keyboard, touchpad etc) are found under drivers/input and PCI device drivers under drivers/pci. There may be further hierarchical organisation too. For example, under drivers/input there are further subdirectories for keyboards, touch screens, mice etc. Other character device drivers such as /dev/null are found under drivers/char. The fs directory houses file system modules. These support a variety of file systems like FAT, NTFS, ext3, ext4 and more. These allow the Linux user to mount Windows file systems, use the Linux file systems and many more, including Mac. The Kernel... a pretty complex beast. As such there is a lot of configuration that can be done. Most hardware providers will have reference configurations that are used as a basis for product specific configurations. Some distributions will provide the configuration file used to build the kernel in the /boot directory. Or sometimes in /proc/config.gz, but this is often not configured as a build option. Anyway, all these configurations are found in configuration files (.config files), which are generally many thousands of lines long. Given that there are so many options, Linux provides utilities to help with the configuration processes (as well as reference configurations from various distros/manufacturers etc). config - this is a basic command line interface: a ton of yes/no style of questions, which you don't want to use! menuconfig - an ncurses inferface with help options etc. nconfig - a newer version of menuconfig with improved user interface, still ncurses based. xconfig - a GUI based interface. These targets can all be found in scripts/kconfig/makefile. The current config is stored in the root directory in the file .config. The default config file used can be taken from your system. For example, when I ran menuconfig it creates the configuration file from /boot/config-4.4.0-78-generic. When you are compiling your own kernel you will probably specify the architecture so you'd specify something like make ARCH=arm menuconfig, for example. But, this will still use a default config and probably not the one you want. Therefore the full make command will be something like make ARCH=arm menuconfig arch/arm/configs/corgi_config, if you're building for the ARM Corgi platform. When you do this, the old .config will be overwritten by your new configuration. Interestingly, but perhaps unsurprisingly, launching most of the config tools will involve a compilation step on the host machine. You can see the exact steps taken by running the make command with the extra option V=1. The make step is required to build the config tool being used. Nice, but how does menuconfig know all this stuff?! When it runs it reads the main Kconfig file, found in the root directory. This will source the main Kconfig for the architecture you are compiling for. The variable SRCARCH is used as it is a slightly modified, depending on platform, version of ARCH. The main Kconfig file is taken from arch/$SRCARCH/Kconfig. So, if we're compiling for arm, the Kconfig file would be found in arch/arm/Kconfig. This file defines a lot of things but also sources a ton of other Kconfig files! Not every menu item is defined in the main file however. It sources many others and will also pull in all Kconfig files it finds. For example there is a Kconfig file in most of the leaf directories of the drivers tree. Xconfig has a few nice advantages like a GUI which will show you the symbols next to the menu descriptions and a beefed up find functionality. 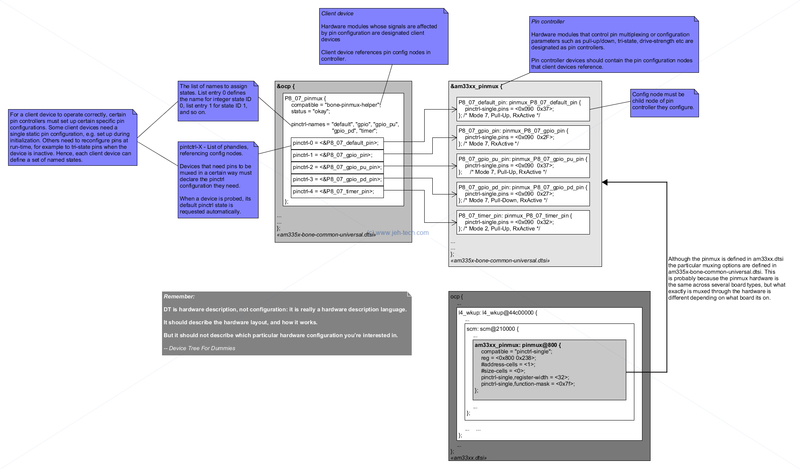 The Kernels own documentation in Documentation/kbuild/makefiles.txt is very comprehensive! The makefile target make oldconfig reads the existing .config file and prompts the user for options in the current kernel source that are not found in the file. This is useful when taking an existing configuration and moving it to a new kernel [Ref]. Before the command is run you would have copied an older kernel config file into the kernel root as .config. This make target "refreshes" it by asking questions for newer options not found in the config file. https://devtalk.nvidia.com/default/topic/906942/failed-to-compile-kernel-module-gcc-cannot-recognize-aarch64-option-mgeneral-regs-only-/ https://developer.android.com/ndk/guides/standalone_toolchain.html Aaaah cross compile for android, make sure you are using the Android prebuilt toolchains! export PATH=/path-to-android-src-root/prebuilts/gcc/linux-x86/aarch64/aarch64-linux-android-4.9/bin:$PATH make prepare ARCH=arm64 CROSS_COMPILE=aarch64-linux-android- V=1 https://glandium.org/blog/?p=2664 - saving my arse! Modules.symvers ??? Under the drivers directory we can see (above) a list of devices for which drivers exist. As well as sysfs entries. For example `getevent -l` lists the devices and their human readable names and associated "eventX"
to have root access to make /dev/input/eventXX writeable! Linux Kernel and Driver Development Training Lab Book by FreeElectrons.com. Linux Kernel and Driver Development Training Slides, Free Electrons. BeagleBone Black System Reference Manual, Rev C.1. AM335x and AMIC110 SitaraTM Processors Technical Reference Manual. Setting Up the BeagleBone Black's GPIO Pins. Notes created whilst working through Linux Kernel and Driver Development Training Lab Book by FreeElectrons.com, whilst consulting the accompanying slides. Use the lab slides! To begin with I hadn't found them and thought the lab book was a little short on descriptions. When I found out they also had slides it made a lot more sense! Note: To begin with I had a rather limited setup where I was doing this. I was compiling on a Linux server but only had a Windows desktop PC. Setting up an NFS server from Windows or from a Virtual Box running Linux or through Cygwin took way too much time and was getting in the way of actually learning anything so I gave up and used a pure Linux system... I'd advise anyone reading this to do the same!!! The flag --depth=1 means we ignore all history to make download faster. Picocom is a minimal dumb-terminal emulation program. Type Ctrl+A, Ctrl+X to exit once connected. By default all files you want to be TFTP'able should be placed in /var/lib/tftpboot. In my install, the directory was owned by root and not in any group which was a pain, so sudo chgroup YOUR_GROUP /var/lib/tftpboot so you can get easier access to this directory. YOUR_GROUP should be a group you already belong to, or a new group, up to you. If you wanted to add a new group, say tftp_users, for example, you could run sudo groupadd tftp_users and then run sudo adduser jh tftp_users , to add yourself to the group and then sudo chgroup tftp_users /var/lib/tftpboot to put the directory in this same group. Then probably sudo chmod g+w /var/lib/tftpboot to give this new group write permissions on the directory. Alternatively you could change the root directory that the sever uses (see below). To the options I added --verbose. Run sudo vi /etc/exports to add this line, replacing "<user>" with your username and the IP address with your board's IP address. For futher information on how to configure the NFS server and even shorted the export path used, see the Ubuntu community guide SettingUpNFSHowTo. The version of UBoot I had by default on my BB did not have the "saveenv" command :( So, for now at least, I will type the boot commands manually rather than worrying about creating a new UBoot image. Can do that later if this becomes a real pain. The memory dump showed contents of test.txt, so we know the TFTP server is running correctly. NOTE: In UBoot, if you want to copy-past these into picocom copy the text into an editor and then replace newlines by "&&" to get a one-liner. 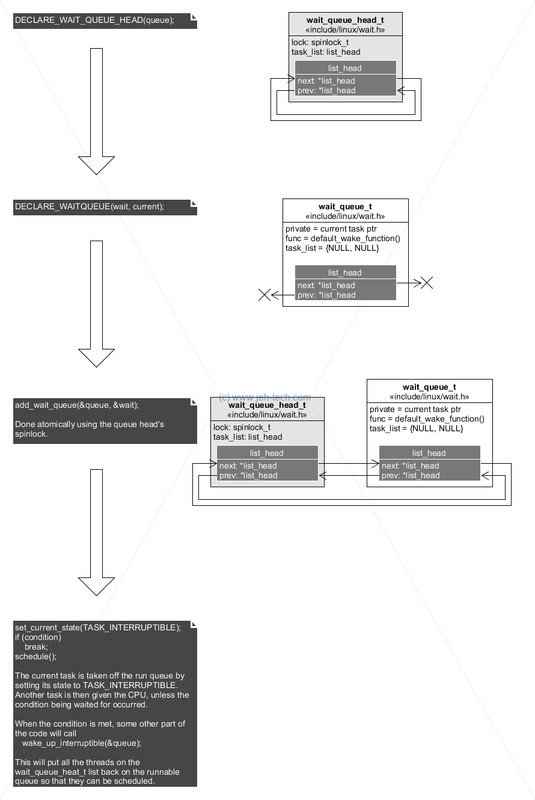 Linux Kernel Makefiles, Kernel Documentation. Device Tree For Dummies, T Petazzoni. 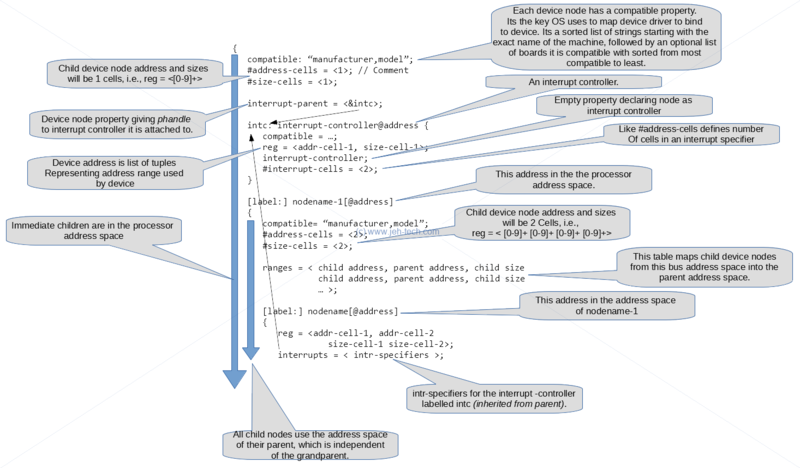 A Symphony of Flavours: Using the device tree to describe embedded hardwarw, G Likely, J Boyer. I needed to create a Kernel build and file system from "kinda-scratch" to boot off an SD card. The instructions I had to follow were slightly different and I've put some brief notes here. The image above shows a [*] next to "NFS client support". This means that the support will be compiled into the kernel image. 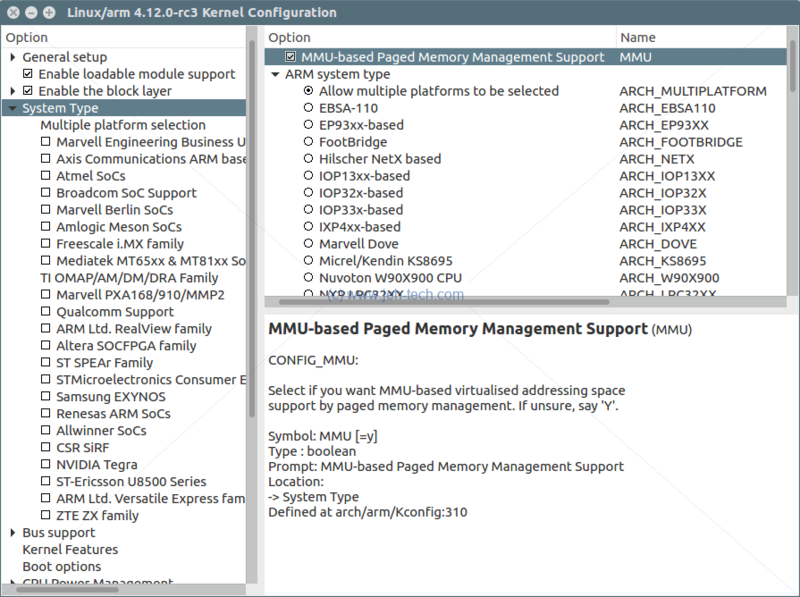 All of the other options with an [M] next to them are compiled as modules. They will not be included in the compiled kernel image but can be loaded separately as modules later. Modules marked with [ ] are not compiled at all. The config system has copied the file arch/arm/configs/omap2plus_defconfig to the root directory and merged in any changes you made manually from the menuconfig utility. # * -jX (optional) sets number of threads used for parallel build. #   see the toolchain commands being invoked. If you list the directory arch/arm/boot you will see the zImage file and another file named dts/am335x-boneblack.dtb. This is the Linux Device Tree blob. It gives the entire hardware description of the board in a format the Kernel can read & understand. [Ref]. Copy both files to TFTP home directory. What Are The zImage and DTB Files? So, we have two files: arch/arm/boot/zImage and arch/arm/boot/dts/am335x-boneblack.dtb, but what are they? The zImage is a compressed kernel image that has a little bit of code in front of the compressed blob that will makes it bootable and self extracting so that the kernel proper can be decompressed into RAM and then run. The am335x-boneblack.dtb is a Linux Device Tree Blob. This is a binary format that the kernel can read and contains the description of the hardware [Ref]. This method was adopted to try and standardise how hardware information was passed to the kernel because in the embedded world there was little standardisation and systems varied considerably [Ref]. In the simplest terms, a device tree is a data structure that describes the hardware configuration. It includes information about the CPUs, memory banks, buses, and peripherals. The operating system is able to parse the data structure at boot time and use it to make decisions about how to configure the kernel and which device drivers to load. So, this is what the .dtb file is. It is generated by many .dts files, which are text files containing a human readable "map" (tree really) of the system's hardware. Using DTB's we can somewhat decouple the kernel build from the hardware it is running on, rather than having to do a specific kernel build for every hardware variant out there! 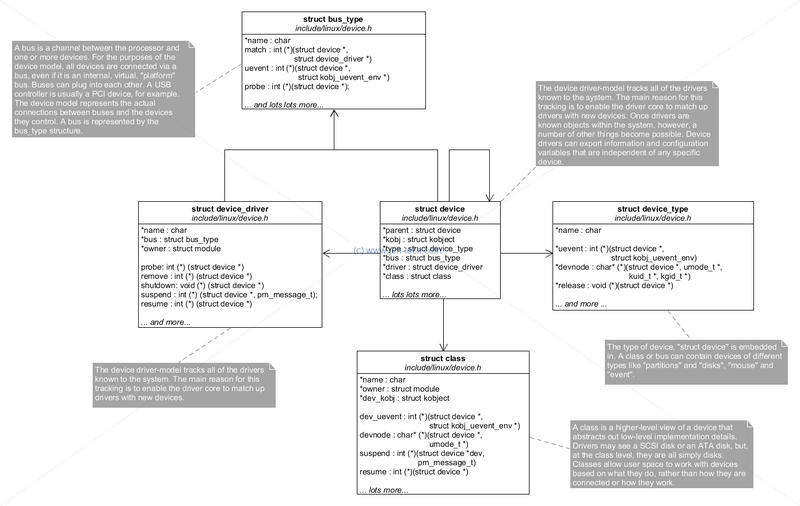 Mostly everything is moving towards using device trees. If CONFIG_OF is defined you know you are in Kernel with device tree and open firmware support enabled. 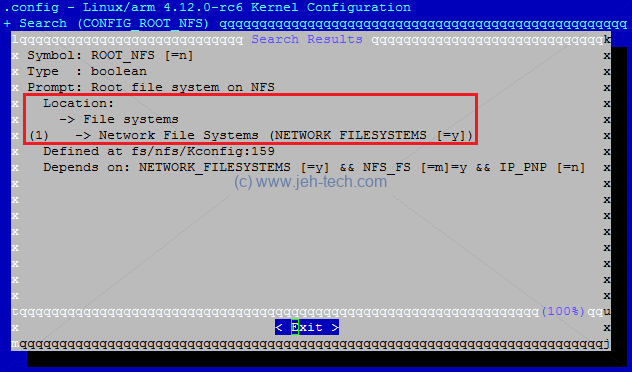 The NFS directory it booted from (you should see a message "VFS: Mounted root (nfs filesystem) on device 0:14") should contain the data from the course labs TAR file. If it does not, you will see a kernel panic saying "Kernel panic - not syncing: No working init found". If you see this, make sure that the directory you shared as /home/<user>/linux-kernel-labs/modules/nfsroot contains the modules\nfsroot folder from the lab file. Based on the previous section we can understand what we have done here. We are booting a zImage. The first argument is the address of the zImage. The second argument is the hyphen, which specifies the address of the initrd in memory as non-existent, i.e., there is no ramfs, and the third argument is the address of the DTB that UBoot will pass to the Kernel. The other important environment variable set is bootargs. This is a string that is passed to the kernel. UBoot will pass this to the kernel. In this case it contains all the information required to tell the kernel to try and mount the root directory over NFS and boot from it. Linux Kernel Development, Third Edition, Robert Love. Building External Modules, Linux Kernel Documentation. Building A Linux Kernel Module Without The Exact Kernel Headers, Glandium.org. The only interesting things in the snippet are the tokens __init and __exit. The functions marked by __init can be removed after either kernel boot or module load completes and the functions marked by __exit can be removed by the compiler if the code is built into the kernel, as these functions would never be called. Navigate to the NFS file system you unpacked and exported over NFS. Change to the root/hello. In the Makefile, I have changed the value of $KDIR as I stashed the kernel source in a different location to that specified in the lab book. Run make all to build. Once built, from the board's console you can type insmod /root/hello/hello_version.ko to load the module. In my GitHub area, I've used my own external build, outside the lab directory, but doing it the lab way will also do an external build. I preffered the former so that I could stash everything in my GitHub repo more easily. When you build your module you'll get a whole load of files generated in your module's directory. One file of importance is Module.symvers, which contains a list of all exported symbols from a kernel build [Ref] and their corresponding CRC (if CONFIG_MODVERSIONS is enabled, which it is in this lab). This set of exported kernel symbols is known as the exported kernel interfaces. Modules can only use these explicitly exported functions which are marked as exported in the kernel code by the macro EXPORT_SYMBOL_[GPL] (the _GPL suffix is option, i.e., we have 2 macros here). Another file of import is hello_version.mod.c, which is auto-generated by the build and compiled into the resulting .ko kernel object file. The file contains some information that is used to "tag" the module with the verssion of the kernel it was built against, so that when it is loaded, the running kernel can check that the module was compiled against the correct kernel headers [Ref]. In hello_version.mod.c, the macro MODULE_INFO(vermagic, VERMAGIC_STRING) is used (define in linux/moduleparam.h). This macro will define a static and constant variable in the section .modinfo. The variable name is based on the tag, which in this case is "vermagic". The value is defined by VERMAGIC_STRING which is based on the the kernel version and git repo status. Thus, when the module is loaded the kernel can scan the .modinfo section of the module object file for the "vermagic" symbol and check that it matches the kernel's own version magic, in this way checking that the module being loaded is indeed written for this version of the kernel. So here we can see a structure that is stored in a specific section. When loading the module the kernel will be able to find this structure in this section and consult the member variables .init and .exit to locate the module's initialisation and exit functions. This implies a mismatch between the kernel version and the header files the module was compiled against! This is very strange as I must surely be building against the right kernel... I've built the kernel and loaded it on the BB after all! So we can see that the .mod.c file is creating an array of modversion_info structs in the section named __versions. The symbol named "module_layout" (the macro __VMLINUX_SYMBOL_STR just strigifies it's argument) is given a CRC value of 0xb1dd2595. This CRC value has been read out of Module.symvers. So, the "invalid module format" message is due to a mismatch between the module's recorded CRC for the symbol module_layout and the CRC the kernel expects (see check_version() in kernel/module.c). Question is how on earth has this happened?! If you type dmesg with debug enabled for module.c, you'll see a lot more information output to the system log. Balls! Cleaning and recompiling kernel solved this issue! Modules can be given parameters at either boot time, if compiled into the kernel, or on module load. They allow some flexibility in module configuration so that, for instance, you could take the same binary and run it on different systems by just toggling a parameter... useful! To find out what the parameter's value is, cat the file with the parameter's name you're interested in. So for our driver, we need to record the time when it was loaded and then record the time when it was removed and calculate the difference. Also note that floating point operations should not be done in kernel code, in case you were thinking of converting values to doubles to do the maths. Essential Linux Device Drivers, S. Vankateswaran, Prentice Hall. How To Instantiate I2C Devices, Linux Docs. Writing I2C Clients, Linux Docs. Checking I2C Functionality Supported, Linux Docs. Free Electrons Guide To Wii Nunchuck I2C Inteface. Beagle Bone Black DTS file is in arch/arm/boot/dts/am335x-boneblack.dts. So, I need do two three: First, check that the pinmux puts the I2C bus on the J9 pins, second enable the second I2C bus, and third create a definition for the new device on that bus. This is the only place where i2c1 is defined in the Beagle Bone Black device tree files. What we're interested in is the MUX mode as in the image above we can see that we will want either mode 2 or mode 3 as these are the only two modes for which the I2C1 pins are muxed onto the P9 connector. 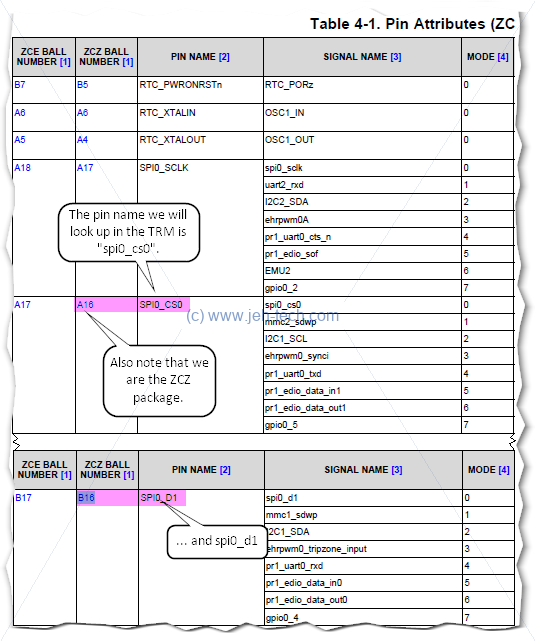 This block of DTS script is defining the pin controller device. It uses the "alternative" binding discussed in the Linux pin control bindings doc [Ref]. This means that the pin binding is specified using a "hardware based index and a number of pin configuration values", which we see specified in the AM3XX_IOPAD() macro. Now some vocabulary: a client device is any module whose signals are affected by pin configuration [Ref]. The node i2c0 shown above is a client device as it's signals are affected by how the pinmux controller is configured. Each client device can have one or more "pin states", which are assigned contiguous numbers, starting from zero. So, this client device only has the one "state". The field "pinctrl-0" is state number 0. It specifies a list of phandles pointing at pin config nodes, which must be (grand)children of the pin controller device. The field "pinctrl-names" gives a textual name to this particular state that can be used. Where there "pinctrl-1"..."pintctrl-N" states, the names list would have N+1 members and the first name would name "pinctrl-0", the second "pinctrl-1" and so on. In this case there is only one state named "default". Back to the node labelled "i2c0_pins" in the pin controller device... what does the child node "pinctrl-single,pins" mean? Well, the contents of each of those ... child nodes is defined entirely by the binding for the individual pin controller device. There exists no common standard for this content" [Ref]. There is some clue however... it seems that there does seem to be some kind of, at least de-facto, naming convention. Where we see "pinctrl-single,pins", the part before the comma generally is the driver name. So we know (also helps that the lab book tells us) that the pinctrl-single driver is being used and a quick search leads us to drivers/pinctrl/pinctrl-single.c. The "pinctrl-single,pins" property is a list of offsets and value "tuples", which agrees with what we noted about the pin binding being specified using a "hardware based index and a number of pin configuration values". In the AM335x, each configurable pin has its own configuration register for pull-up/down control and for the assignment to a given module: okay good, matches the pinctrol-single driver's description. Section 9.3 of the TRM, table 9-10, lists the memory-mapped registers for the control module. From this we can see that registers 0x988 and 0x98C are labelled conf_i2c0_sda and conf_i2c0_scl respectively, which is what we would expect for the I2C0 interface. One last question is where does the make system get information about what DTB to construct for our target. The file arch/arm/boot/dts/Makefile lists which DTBs should be generated at build time [Ref]. In this file we can see the Linux make target dtb-$(CONFIG_SOC_AM33XX), which lists am335x-boneblack.dtb as a target. This is a classic kbuild definition. If CONFIG_SOC_AM33XX is defined then this target will be built, otherwise it is ignored. Once build the precise build command used are saved in arch/arm/boot/dts/.am335x-boneblack.dtb.cmd. I'm copying am335x-boneblack.dts to am335x-boneblack-wiinunchuck.dts and adding its DTB as a dependency for the dtb-$(CONFIG_SOC_AM33XX) target. This outputs the file arch/arm/boot/dts/am335x-boneblack-wiinunchuck.dtb. This needs to be copied to the tftp directory on the host and the UBoot boot command changed to download this rather than the "stock" DTB file. When a device driver is about to probe, the device core will automatically attempt to issue pinctrl_get_select_default() on these devices. This way driver writers do not need to add any of the boilerplate code ... ... So if you just want to put the pins for a certain device into the default state and be done with it, there is nothing you need to do besides providing the proper mapping table. The device core will take care of the rest. Err... is this true? I've had a little search through the 4.4 kernel and the references I find to pinctrl_get_select_default() are pretty minimal. They seem to occur in some device specific files and then ones that look more generic like gpio-of-helper.c::gpio_of_helper_probe(). But even that seems like it is a specific driver, which probably does the pinctrl "boilerplace", but would need to be compiled into the kernel, and in any case only would apparently work for GPIOs. A search for the device manager and where it might probe devices revealed dd.c::really_probe(), part of the attempt to bind a device with a driver, which calls pinctrl_bind_pins() before probing the device. The comment for pinctrl_bind_pins() says ...called by the device core before probe... , which gives us the answer for this kernel. And, in fact, it calls pinctrl_set_state() for the default state. What I also found is that there is an "&init" state too that will superceed the default state at initialisation. The above quote is either inaccurate or for another kernel version. The I2C core is a code base consisting of routines and data structures available to host adapter drivers and client drivers. Common code in the core makes the driver developer's job easier. How To Compile And Install The Device Tree Compiler On Ununtu. Linux uses device trees to avoid having to recompile the kernel for every single variation of a board, for example. So, on one architecture, say for example 64-bit Arm, we don't have to recompile the kernel for every possible combination of 64-bit Arm chip and its peripherals. Instead, a device tree is stored somewhere, for example an EPROM, and can be passed to the kernel at boot time so that the same binary kernel image can run on multiple platforms and the platforms themselves tell the kernel binary what they "look" like. Device tree files can also import other device tree files and also C header files so that it is easy and less error prone to share named quantities between kernel code and the device tree. The device tree is exposed in Linux under the /proc/device-tree/ directory. The directories are paths in the device tree and the nodes can all be cat'ed. If you have the device tree compiler on your system, which is contained in the device-tree-compiler package, you can use dtc -I fs /sys/firmware/devicetree/base [Ref]. 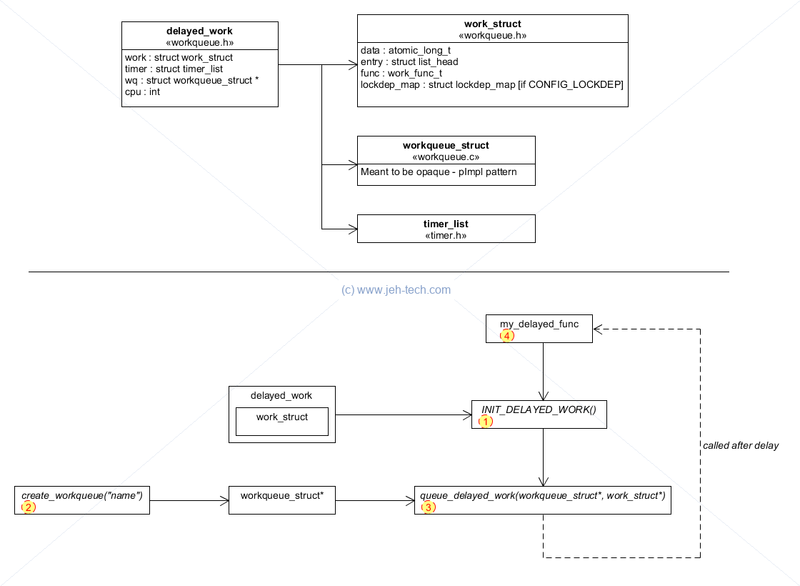 Interrupt definitions in DTS (device tree) files for Xilinx Zynq-7000 / ARM, Eli Billauer's Tech Blog. SPI flag - 0 means device is not using a Shared Peripheral Interrupt (SPI), anything else means that it is a shared interrupt. Interrupt line number. This is the hardware interrupt number. It is a peripheral interrupt identifier in the actual hardware interrupt controller. Interrupt type - edge, level triggered etc. This can be an ORed combination of some of the flags in irq.h. For example, it could be IRQ_TYPE_LEVEL_HIGH or IRQ_TYPE_EDGE_RISING. #interrupt-cells property is used by the root of an interrupt domain to define the number of <u32> values needed to encode an interrupt specifier. Search up the interrupt tree to find the first #interrupt-cells property. split out the intspec into the out_irq struct's specifier array. irq_create_of_mapping - translate a device tree interrupt specifier to a valid linux irq number. 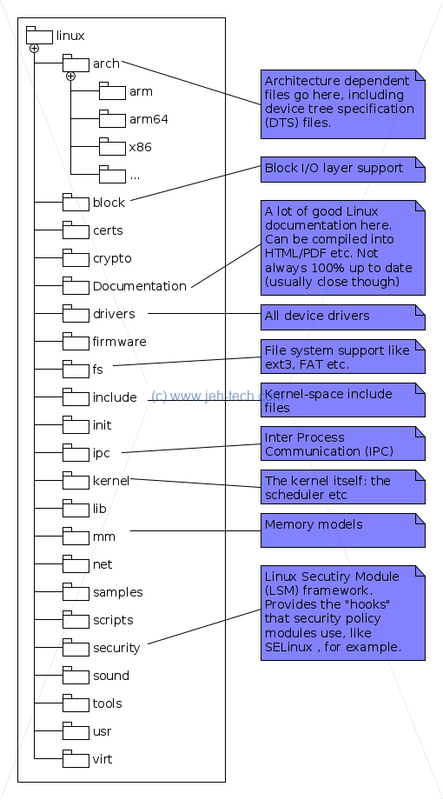 Linux Device Driver Model Overview, Linux Docs. Device Drivers, Linux Kernel Docs. So what is the Linux device driver core? It is a central "repository" that tracks all the device busses in the system and their types, all the available drivers and all the devices and marries drivers with devices when they are detected. Bus types define, surprisingly, a type of bus, for example PCI or I2C. The physical hardware that manages access to a physical instance of the bus type is called an "adapter driver". The device structure represents physical devices that are attached to am adapter driver and device_drivers are bound to devices when a device is detected by the system. All devices have a class so that the user can generalise devices by their use. Having looked through the driver core's code a little it looks like devices will be detected, except hot pluggable devices which must have another route to driver binding, like this. The driver will register the device(s) for which it caters either at system start-up or dynamically (when insmod is called to load a driver). This will eventually result in a call to the driver cores device_add(), which will do things like creating the sysfs entries for the device, adding the device to the bus_type via bus_add_devices(), and finally calling bus_probe_device() which will eventually via either the bus_type or directly, call the drivers probe() method. Buses that support hot-plug devices, such as USB for example, must have another way to alert the core that a device has become available. For now, I'm ending my learning-via-code-base as its probably a bit more depth than I need right now. You can see which drivers are statically compiled into the kernel using the following command [Ref]. Sysfs - The file system for exporting kernel objects, Linux Kernel documentation. Attributes can be represented in the sysfs file system for kobjects, which is useful from a device point of view because it allows the driver to intercept read and writes of these attributes in order to control a device. For example, the Atmel MaxTouch device driver creates several attributes, such as "pause", which when written to can be used to pause the touch screen device being driven. Or, for example, it could export an attribute that would let the user configure touch sensitivity for example. It will create and initialise a device_attribute struct for you and give it the name dev_attr_myname, which you can then pass to device_create_file. PINCTRL (PIN CONTROL) subsystem, Linux Docs. Pin Control Bindings, Linux Docs. GPIOs on the Beaglebone Black using the Device Tree Overlays, Derek Molloy. Hardware modules that control pin multiplexing or configuration parameters such as pull-up/down, tri-state, drive-strength etc are designated as pin controllers. Each pin controller must be represented as a node in device tree, just like any other hardware module. The pinmux core takes care of preventing conflicts on pins and calling the pin controller driver to execute different settings. For example, the Beagle Bone Black has a limited number of output pins and you can choose what gets output via the P9 header. For example, P9 pin 17 can be used by either the SPI, I2C, UART or PWM components of the SoC [Ref]. A list of a load of pin control device-tree bindings can be found in the Linux source tree documentation folder under devicetree/bindings/pinctrl. From a driver's point of view, it must request a certain pin muxing from the pin control sub system, although generally it is discouraged to let individual drivers get and enable pin control . So, for example, in the Free Electrons Lab book we would assume that out Wii Nunchuck is permanently connected to the system and so our BeagleBone configuration would always be setup to enable the I2C muxing on the P9 connector. To see a list of the claimed pin muxes (and the GPIOS) you can type the following: cat /sys/kernel/debug/pinctrl/44e10800.pinmux/pinmux-pins. Just remember these are the pins of the chip, not just, for example, the GPIO pins!! Driver porting: sleeping and waking up, Corbet on LWN.net. My little toy example. Wait queues and timers. 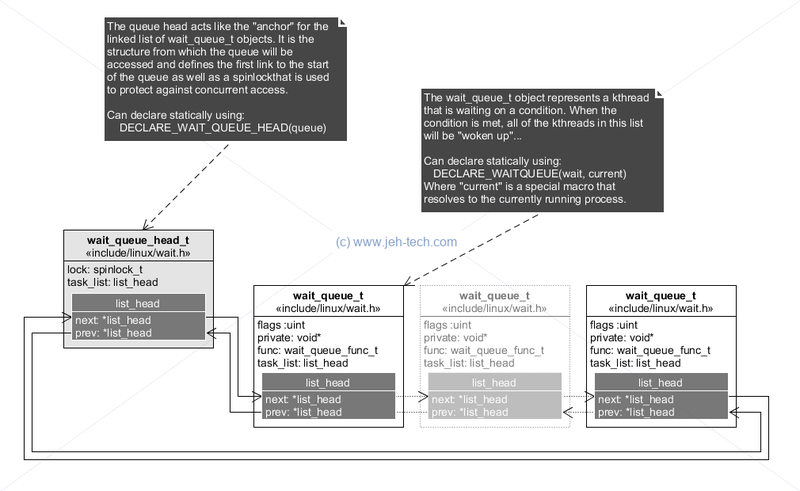 The wait queue is a mechanism that lets the kernel keep track of kernel threads that are waiting for some event. The event is programmer defined, so each bit of code can declare its own wake queues, add kthreads to this queue when they should block waiting on a condition and then signal all kthreads waiting on that condition when it is met. The queue, accessed through the wait-queue API, is always accessed atomically so many threads can use the same queue to wait on the same condition(s). // Tell the scheduler to take us off the runnable queue. There's one small thing to note in the above example vs the reference... I had to move where the condition was checked. I think their logic was a little wrong because if you don't check after the schedule, you'll always do one more wait that you need to! One or two examples I came across use something called interruptable_sleep_on(), but apparently this is deprecated since 2.6 because it is prone to race conditions [Ref]. A semaphore is more of a concept, rather than a specific implementation ... The Linux semaphore data structure implementation uses a wait-queue. Without a wait queue, you wouldn't know which process demanded the resource first, which could lead to very large wait times for some. The wait-queue ensures fairness, and abates the resource starvation problem. Snippets from kernel v3.18.20 so possibly already quite out of date :(. Where firmware_p is used to return the firmware image identified by the name for the specified device. Following the code one can see that there are various ways that the firmware can be located. But how do these files make it into the firmware image in the first place? The answer comes for the Makefile firmware/Makefile, a snippet of which appears below. Note that the kernel must have been built with CONFIG_FIRMWARE_IN_KERNEL=y. The patsubst macro finds all white-space seperated words in $fw-shipped-y and replaces them with $(obj)/<word>.gen.S to create a list of targets for this command. For each of those targets the command cmd_fwbin is called to create the target by echoing the linker section asm commands into an asm file (the .incbin puts the image into the section so that the firware becomes part of the compiled kernel image). Thus once the asm files are created, built and linked into the kernel image, the kernel includes these bits of firmware in its final binary. When a driver defines this variable it will, via the KBuild magic, get included in $fw-shipped-y assuming that the kernel was build using the CONFIG_FIRMWARE_IN_KERNEL=y config option. If the image is not found in the built-ins, the next port of call is to engage a user-mode helper to grab the contents of the firmware from a file and "pipe" it into a driver buffer. Where fw_path_para is a string that can be passed to the kernel via the command line to allow boot time configuration of where firmware files can be looked for. Debugging the kernel using Ftrace - part 1. Debugging the kernel using Ftrace - part 2.
trace-cmd: A front-end for Ftrace. Secrets of the Ftrace function tracer. The above are two really useful references on how to use ftrace to see what is going on inside the kernel using files found in /sys/kernel/debug/tracing. Use the article "Secrets of the Ftrace function tracer" to see how to limit the increasible amount of information that can be thrown at you through the trace. To get a nicer interface to the above take a lookg at trace-cmd. See functions like  time_after(a,b) or time_in_rance(a,b,c) to deal with timer wrapping. Note the check on the return value of down_interruptible; if it returns nonzero, the operation was interrupted. The usual thing to do in this situation is to return -ERESTARTSYS. Upon seeing this return code, the higher layers of the kernel will either restart the call from the beginning or return the error to the user. If you return -ERESTARTSYS, you must first undo any user-visible changes that might have been made, so that the right thing happens when the system call is retried. If you cannot undo things in this manner, you should return -EINTR instead. To schedule a recurring short task that executes in interrupt context and on the CPU that create the timer. You need to know exactly the confiuration of the kernel on which your modules will be loaded, which means you must compile your kernel before compiling your modules so that you have what is needed to compile your module. The kernel build makefile is very complex and needs at least two options to cross compile it - ARCH and CROSS_COMPILE. Default ARCH is the architecture of the host machine, not x86 necessarily. GCC is the only compiler that can compile the linux kernel. Linux kernel is not a C compliant program because it uses features of GCC that are not specified by the language. But these features are needed to make a kernel, which made the kernel specific to the compiler on which it was tested as these are undefined features of the C language. Use the "O" option to cmompile out of source so that you can use same source for different build variants. 1. Tools can check this automatically - use them to detect dependencies between options etc. Avoids incorrect configs. 2. The C compiler cannot read this file. It reads .h files that procide the same options. The config tools generate the .h files in an autogenerated location in the build tree that will duplicate the configuration options provided in the .config file. The source is .config and the output is the .h. There are 1000s of config options so start with a default config for your board [my_board_or_soc]_defconfig. Used to be board specific but is now SoC specific. The device tree is the BSP. THe kernel tends to be generic for all boards made from one given SoC or even SoCs of a given family and the device tree provides the customisations due to constraints on the system designed using the SoC, e.g. PCB layout. Build outputs is zImage, uImage. UBoot traditionally use uImage, an image packaged for uBoot, but now uBoot doesn't need this anymore and use, usually, a zImage or a plain image. Images generally include a checksum of some form. Can avoid mix-and-match attacks when ram disk and kernel version and device tree are not what expected. Built into the new images - FITs. That is why new image isn't used any more. FIT has the same syntax as a device tree with options that can specify how to boot the kernel. FIT = flattened image tree. [See https://elinux.org/images/f/f4/Elc2013_Fernandes.pdf]. zImage not always favoured as decompression works without the MMU, without caches so it is faster to read a non-compressed image. Also before uncompressing itself it has to relocate itself, otherwise it is doing decompression in place which doesnt work. So on 64 bit systems (ARM) normally boot with plain image but 32 bit use zImage. vmlinux is the ELF file that corresponds to the linux kernel as it will be loaded in virtual memory for execution. Exactly the same format as a linux application. not always ubootable. INSTALL_PATH and INSTALL_MOD_PATH are useful and used in installation makefile targets. Modules are generated througout the build tree so theser have to be grouped to a known location on your ram disk - so use `make modules_install`. Once here must use `depmod -a` to create the files needed for Linux device module to work correctly. init_module and cleanup_module should have a module specific name. Good practice to print loading and unloading message for module load and unload event. But use short messages because prink() disables interrupts whilst using busy-waiting to poll for characters - eek! Don't use printk() elsewhere for this reason - there are new and better debug options!